This Sunshine Pico de Gallo recipe is inspired by flavor combinations in my favorite Fresh Fruit Salad and these Pineapple - Jalapeño Margaritas. 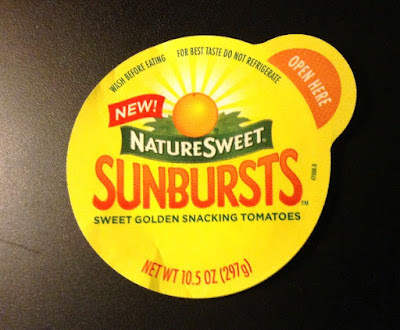 The fresh fruit flavors are immediately refreshing and bright -- like a bite of sunshine. Zest the grapefruit, taking care to avoid the white pith because it is bitter and undesirable in this dish. Using only the colored portion, divide the zest into two parts. Freeze half of the zest for another use and set the other half aside. Supreme the grapefruit over a covered bowl (or measuring glass) to collect the juice. This step is important because the membrane detracts from this dish. 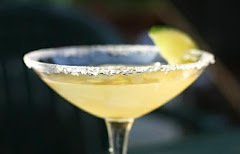 Place the grapefruit segments and zest in the bowl (or measuring glass) with the grapefruit juice. Gently separate the grapefruit segments into pieces similar in size to the mango. To the bowl (or measuring glass), add all remaining pico de gallo ingredients and toss lightly to combine. Taste with a chip and adjust seasonings. Cover and let rest in the refrigerator several (two to four) hours. Drain juice before serving cold or at room temperature with tortilla chips as a dip, or as a condiment with grilled chicken. Cover and refrigerate any unused portions. In my opinion, this Sunshine Pico de Gallo benefits from resting in the refrigerator several (two to four) hours before serving; however, I also enjoy it right away. I rarely use salt and seasoned only with the fresh cilantro; however, you could add salt and different fresh herbs. After about eighteen (18) hours in the refrigerator, I found the grapefruit taste was understated elegantly. Also, the Serrano chile pepper heat is more gentle than I expected. Nevertheless, the flavor is fantastic. 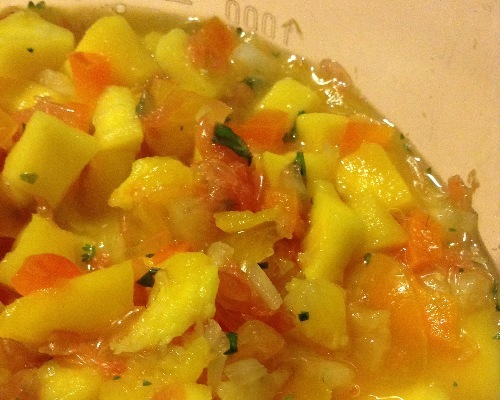 I was aiming for more punch from the Serrano; however, I will continue improvising the Serrano amount in Pineapple Salsa (recipes here). 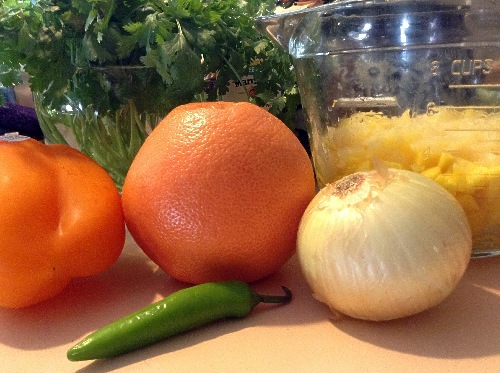 I use a microplane to remove only the top layer of the colored citrus peel (next photo). Here's a "How To: Zest Citrus" video via Real Simple.com. To capture as much juice as possible, I supreme the grapefruit and break segments over a covered measuring glass. 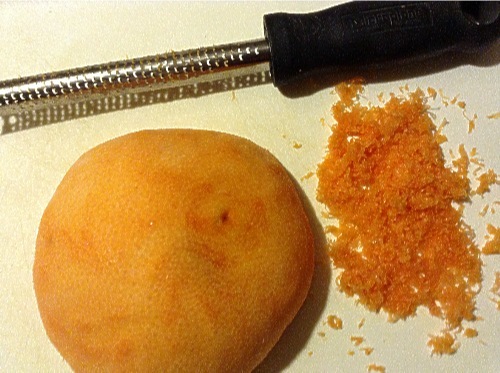 When zesting citrus, use only the bright colored portion (on right) of the peel. If you are uncomfortable supreming the fresh grapefruit, you can halve it and use a grapefruit spoon to segment it; then, remove the membrane with your hands. After removing the membrane, use a knife to chop the grapefruit segments to the desired size, or just separate them with your hands. 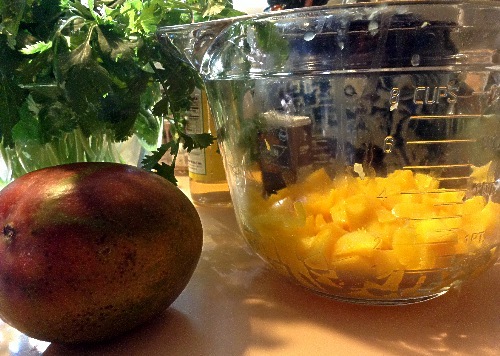 Below this photo of two fresh mangoes (one is diced in the glass measuring glass) and a bunch of fresh cilantro, I've included links to the videos I found most helpful offering tips about selecting, storing and cutting mangoes in our How To Index here. After seeding the SunBursts™ tomatoes I used kitchen shears to cut them into strips. If you wish to just halve the small tomatoes, here's a quick-cutting tip via The Yummy Life. As shown in the above photo, the NatureSweet® SunBursts™ label notes, "For best taste do not refrigerate." Typically, and even before cutting, I refrigerate them. You may prefer to slice and add these tomatoes at room temperature just before serving the Sunshine Pico de Gallo. Rice vinegar allows the fruit flavors to shine here. 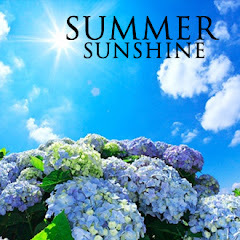 I think I bought Marukan® Sodium Free Sugar Free Rice Vinegar at Whole Foods Markets (find a store here). This rice vinegar is diluted with water before bottling for a lower (4.3%) acidity than some other vinegars (e.g., apple cider commonly 5.0% acidity). If you choose a different vinegar, I would expect the results to be much more tangy.